This Mtn Surprise season, Mtn users stands the chance to get airtime to make calls to family and loved ones, free data to browse online, free tickets to mtn live event, shopping vouchers whenever you transfer cash with mobile money and a lot more. What you need to do is to simply dial *142# on your mtn line and you will get options to select your surprise offer from MTN. 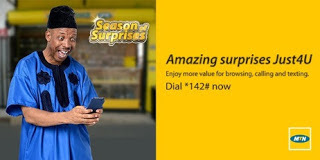 Note: Most MTN Sims surprise package is different from of other Sims. So dial the code now to see the surprise package you get.